Cody, Ashley, "The Rotorua Geothermal Field, New Zealand: Geysers in New Zealand, 1998, GOSA Transactions (VI), pp. 34-49; Bryan, T. Scott, The Geysers of Yellowstone, 3rd ed., 1995 (Univ. 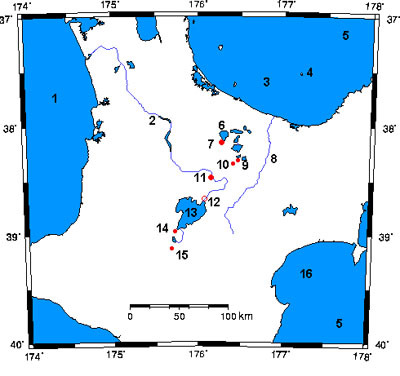 Press of Colorado, Niwot, CO); Natureandco.com, "Geysers and Major Geothermal Features in New Zealand", online [http://www.natureandco.co.nz/travel_and_adventure/sightsee/volcanics/geysers.php3]; Online Map Creation, online [http://www.aquarius.geomar.de/omc/]. Last modified 20 April 2001.